Vaccines for hepatitis B have been available since the 1980’s beginning with the first plasma derived vaccine and progressing to vaccines utilizing recombinant hepatitis B surface antigen (HBsAg). 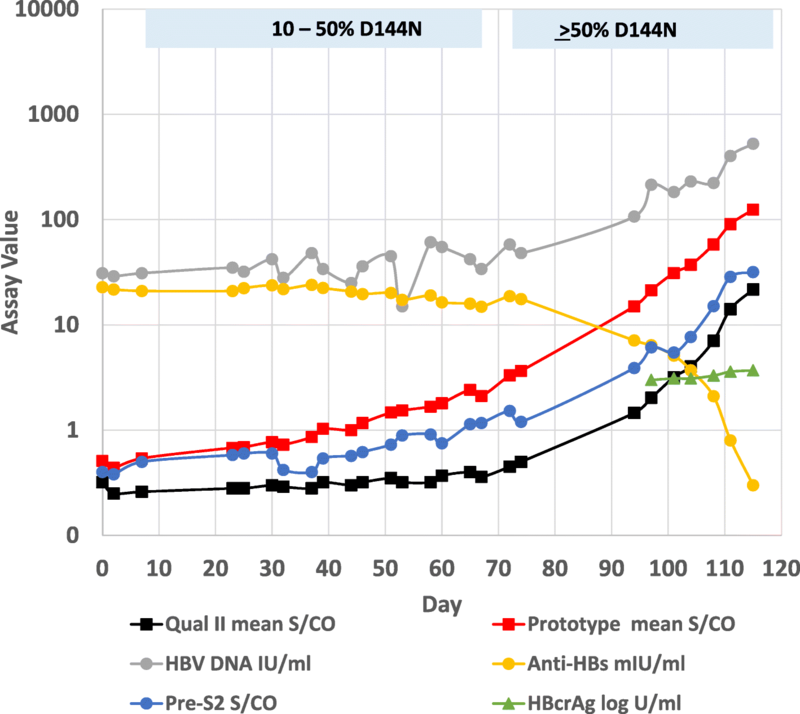 Over 90% of adults respond to a full vaccine course with protective levels of antibody to HBsAg (anti-HBs) greater than or equal to 10 mIU/ml [1, 2]. Although the vaccines are highly effective, hepatitis B virus (HBV) infections in vaccinated individuals have been described [3–9]. No HBsAg mutations were found in panel 11,000, a profile that has been reported for some vaccine breakthrough infections . In contrast, panel 6272 displayed a number of substitutions in the preS-S region including a substitution at amino acid 144 (in the second loop of the ‘a’ determinant) where mutations are known to cause viral escape from vaccine-induced anti-HBs or hepatitis B immunoglobulin (HBIG). Mutations at this site are also associated with occult hepatitis B infection, escape from diagnostic assay detection, and impaired secretion of virions [16–19]. The most frequently reported mutations at amino acid 144 result in substitution of alanine, histidine, or glutamic acid for aspartic acid (D144A/E/H). The D144N mutation (aspartic acid to asparagine) is a recently identified, rare mutation that has been reported only four times previously: a vaccine breakthrough infection (genotype A2) in a patient who received a liver transplant from an anti-HBc positive donor, and in three HBV infected individuals from Iran, Tanzania, and China (genotypes D, A1, and C, respectively) [5, 20–22]. Only the first report was able to identify the clinical and diagnostic relevance of the mutation. To our knowledge, the current study is the first report of the D144N mutation in association with a vaccine breakthrough case in the United States. Hydrophilicity analysis of the second loop of the HBsAg major hydrophilic region by the Hopp & Woods method  indicated that a mutation to asparagine at amino acid 144 would result in a reduction in hydrophilicity similar to that for the A/H mutations, suggesting that the D144N mutation may affect the presentation or conformation of this epitope in the ‘a’ determinant. It has been reported that HBsAg coexisting with anti-HBs occurs in 10–25% of chronic hepatitis B patients [24–26]. Some investigators have suggested that screening for vaccine induced anti-HBs in health care workers or in high-risk settings be accompanied by HBsAg testing since the presence of immune levels of anti-HBs does not exclude infection [26, 27]. 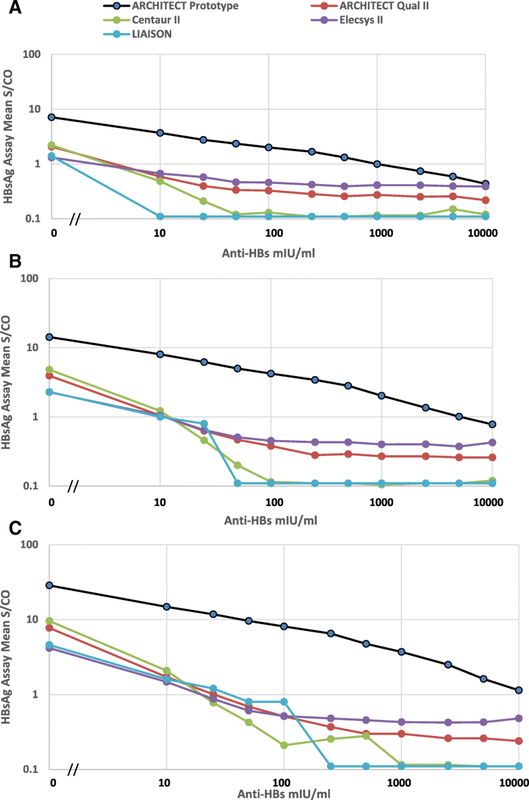 The ability to detect HBsAg in these settings may be affected by the HBsAg assay used, requiring a test with broad mutant detection and sensitive detection of HBsAg. 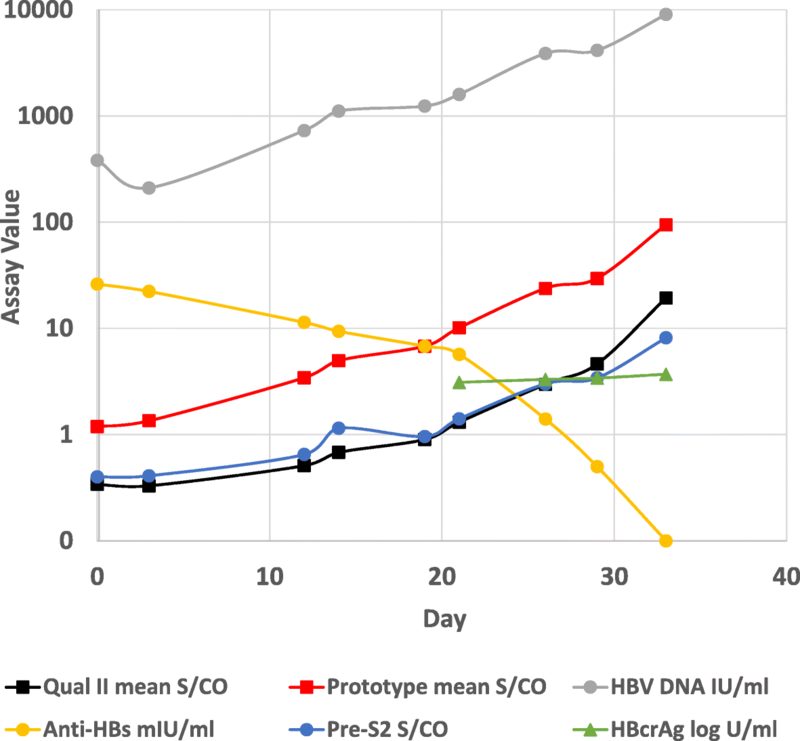 In the current study, testing of an HBsAg-anti-HBs panel showed that the new prototype HBsAg assay was able to detect low HBsAg levels (0.06–0.23 IU/ml) in the presence of anti-HBs concentrations 250–400 times higher (depending on the antigen concentration) than that tolerated by current HBsAg assays.